GO Transit’s Richmond Hill line provides weekday rush-hour train service between Richmond Hill and Toronto and all stops along the way. Trains run south in the morning and north in the afternoon. Through its Regional Express Rail project – better known as GO expansion – Metrolinx is already starting to transform the existing GO rail system from a commuter service to a whole new rapid transit experience for your community. 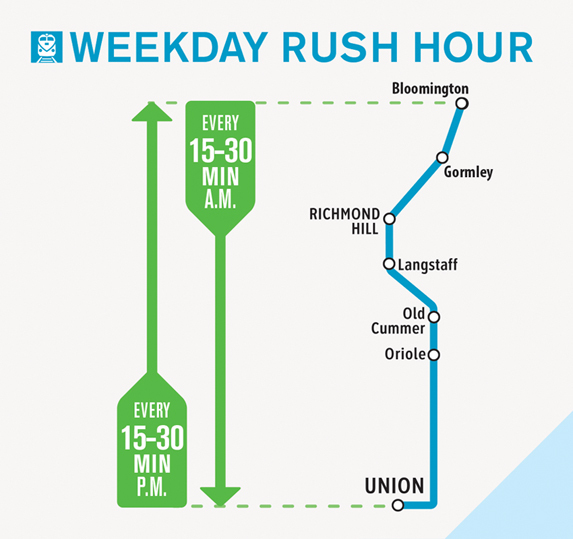 With more frequent rush-hour service from Monday to Friday, you’ll have more options to get you where you need to go. Actual times between trains may be shorter. *A new station at Bloomington Road is currently under construction. Service to Gormley GO Station at Stouffville Road and Leslie Street started on December 5, 2016, providing increased train service to the York Region. Construction of the new station at Bloomington Road started in early 2017. Once complete this station will have 1000 parking spaces and a future MTO car pool lot.